This is a test kit which contains a single one ounce container for each of the 24 colors in the Iddings lineup. Great for small scale mock-ups or just to experiment with colors! This concentrated casein scene paint is formulated using only the highest quality artists' pigments available. The range consists of 24 brilliant, non-muddying colors, with an infinite range of intermediate hues possible through mixing. Iddings Deep Colors dries to a super flat, non-reflective finish which can be easily touched up. It is perfect for backdrops and other porous surfaces and can be easily diluted with water to reduce costs without loosing color vibrancy. A casein binder is not water resistant, allowing Iddings Deep Colors to be washed off non-porous surfaces. This makes it ideally suited for film and television sets. When used on non-porous or hard to paint surfaces, Rosco Clear Acrylic can be added to improve adhesion and durability and to increase its water resistance. Iddings Deep Colors is intended for interior use only. 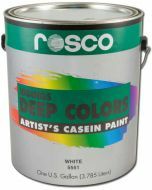 Available in 24 artists' colors that are easily intermixed or combined with other Rosco paints. DilutionDilute with water, Rosco Clear Acrylic Glaze or a combination of the two as necessary. Diluting will reduce the color concentration and creates "glaze" effects. Diluting with more than 2 parts water may reduce binder strength. Adding in Rosco Clear Acrylic Glaze helps to restore adhesion and flexibility. Surface PreparationSurfaces should be clean, dry and free from dirt and grease. Prep porous surfaces and fabrics to accept paint. If painting a new plaster surface, prime wall with a commercial primer/sealer designed for raw plaster. Then use Rosco Tough prime as a final preparation before painting with Iddings Deep Colors. ApplicationStir contents well before use. Apply by brush, roller, or spray gun. Apply in thin uniform coats, using a good quality brush or roller. Use overlapping strokes, keeping a wet edge. Change roller direction often to avoid patterns and streaking. Average Dry TimeAt 75°F, dries to the touch in 30-45 minutes. Can be recoated in 1-2 hours. Shelf LifeMinimum shelf life for unopened, sealed paint is approximately 24 months when stored in a temperature controlled location. Opened can 1-4 months depending on conditions. Adding pine oil to the can before storing will increase its shelf life. CAUTIONSDo not apply when surface or air temperatures are below 50°F (10°C). Keep from freezing. Avoid prolonged contact with skin or breathing of spray. Do not take internally. Use adequate ventilation. KEEP OUT OF REACH OF CHILDREN. 10.13" x 12.75" x 2"
Guidelines and suggestions on how to produce the most common scenic finishes, including: Marble, Brick Walls, Wood Grain, Rust, Granite, & Wallpaper.